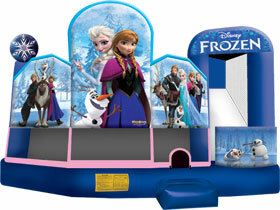 --> Carter's Rock-n-Rides....Exciting, fun rides brought to your Party or Celebration!!!!! 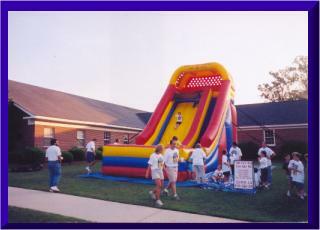 Carter's Rock-n-Rides is just the thing for your special occasion. Whether you are celebrating at church, home or business, Carter's has the rides and attractions to make it a memorable day! With new rides coming all the time, we will provide you with the best looking, safest and well maintained attractions in Middle Ga. Please take some time to review our rides, and contact us with any questions or events you would like to plan. 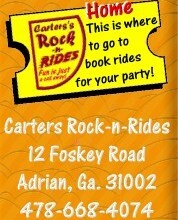 Carter's Rock-n-Rides is just the thing for your special occasion. Whether you are celebrating at church, home or business, Carter's has the rides and attractions to make it a memorable day! 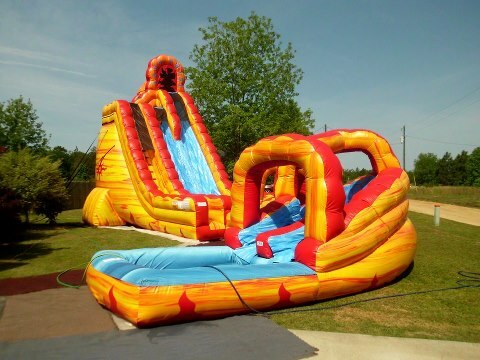 With new rides coming all the time, we will provide you with the best looking, safest and well maintained attractions in Middle Ga. Please take some time to review our rides, and contact us with any questions or events you would like to plan. Feel free to contact us using our online contact form or just call us direct at the number to the left. We will happy to hear from you and look forward to helping you with your next special event. We'll see you at the party! 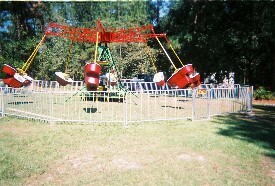 Carter's Rock-n-rides, Inc. Copyright 2004. All Rights Reserved.